About: Alder Hey Children’s NHS Foundation Trust (Liverpool, England) is one of Europe’s largest children's hospitals, with over 275,000 patients and families visiting the Trust each year. In addition to the hospital’s main site, Alder Hey offers pediatric services at a number of community sites across Merseyside, Cumbria, Shropshire, Wales, and the Isle of Man. Challenge: The NHS in the northwest counties of Cheshire and Merseyside (C&M), which includes Alder Hey, is working to connect healthcare and social services organizations through interoperability initiatives. As a main provider of pediatric care, Alder Hey works with children who transition to various outpatient settings; thus, they aspired to develop a method for sharing patient records across the region. Execution: The NHS designates the creation of sustainability and transformation partnerships (STPs) — also referred to as health information exchanges (HIEs) — to promote more coordinated, cost-effective care. Many different vendors feed the C&M STP. 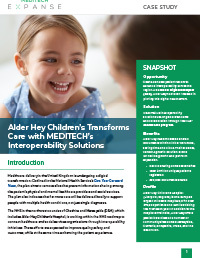 To help develop the pathway for sharing patient information, Alder Hey elected to use the continuity of care document (CCD) available through MEDITECH, as MEDITECH is the only vendor using formatted data and global standards for cross-enterprise document sharing. Improved clinical decision-making due to the availability of relevant information during the clinical encounter.